The new Maruti Ertiga is just days away from its launch and the second generation of the company’s popular MPV looks all set to carry forward the legacy of the current version. While the outgoing model is based on the last generation of the Swift, the new version is derived from the latest version of the company’s popular small car. One thing that is for sure is that the new generation of the popular MPV will be pricier than the current version. However, the new model will be able to justify the increment in price with its more powerful engine, more features, and more interior space. While the current model is on sale in a price range of Rs 6.34 lakh to Rs 10.69 lakh, the new generation version will easily cost around Rs 75,000 more. Again, we feel that the difference in price is justifiable as the latest MPV will offer much more than the outgoing version. The petrol version of the 2018 Maruti Suzuki Ertiga will feature a 1.5-litre naturally aspirated four-cylinder petrol engine instead of the 1.4-litre unit that is available on the current version. The bigger engine will be available with the same transmission choices as the current model, which include a 5-speed manual and a 4-speed automatic unit. The new 1.5-litre petrol engine outputs a maximum power of 105 PS along with a peak torque of 138 Nm. In comparison, the 1.4-litre unit of the current MPV offers only 94 PS and 130 Nm. The difference in the performance won’t affect the fuel mileage. The new engine will be more fuel efficient than the current model. This will be because of the fact that the new model is underpinned by the company’s lightweight HEARTECT platform. Another reason will be the introduction of the second generation of the company’s SHVS mild hybrid technology in the petrol version of the new Ertiga. The diesel engine of the current model will be carried over to the next version. For its popular MPV, Maruti has been using a 1.3-litre DDIS200 diesel engine that outputs a maximum power of 90 PS along with a peak torque of 200 Nm. Like the current car, it will have the SHVS mild hybrid technology, which should boost the mileage to a fair extent. Maruti Suzuki models are known to offer simply amazing fuel mileage figures, and the new generation of the MPV will be no different in this aspect. In spite of the increase in the power of the petrol variant, it will deliver a higher fuel efficiency than the current model. This will be because the new model will be underpinned by the lightweight HEARTECT platform, which will ensure that the kerb weight remains under a check. Another reason will be the SHVS tech. As the engines come from the Ciaz, we expect similar mileage figures. Hence, we expect an ARAI-stated mileage of more than 21 kmpl. In comparison, the current version of the MPV offers only 17.5 kmpl. Currently, the diesel version of the Ertiga offers a peak mileage of 24.52 kmpl. While the new model will retain this oil-burner, it is expected to output a slightly better mileage. Unlike the current version, the next-gen MPV won’t have a CNG model on sale. This is because the outgoing model will be re-branded as a ‘Tour’ model and will be available to the fleet operators with the CNG version. One area where the 2018 Maruti Suzuki Ertiga will have a clear upper hand over the current version is safety. The new model’s lightweight platform not only results in weight savings but is also more rigid than the current version’s architecture. This gives the new car a higher structural rigidity. The new version will have dual front airbags, ABS with EBD, ISOFIX child seat mounts, and reverse parking sensors as standard on all the trim levels. In comparison, most of these features were restricted to the higher variants of the current model. Regarding comfort- and convenience-enhancing features, the new model will again win this section of our new 2018 Maruti Ertiga vs Old model comparison. The latest version of the new-gen MPV will have a 7-inch touchscreen SmartPlay infotainment system that supports Apple CarPlay and Android Auto. It will also have features like automatic climate control with rear AC vents, push button start/stop with keyless entry, auto-dimming IRVM among, dual-barrel projector headlamps, LED DRLs, and a lot more. While the new Maruti Suzuki Ertiga retains its MPV form factor, it looks bolder and more attractive than the current version. 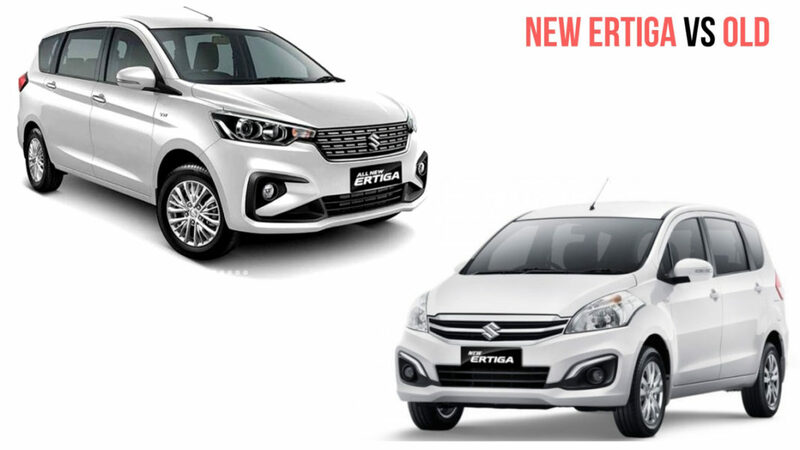 While the outgoing generation looks like a grown-up version of the Swift, the 2018 Ertiga looks completely unlike any other model from the country’s largest selling manufacturer. There are many stylish touches that help the car stand out. Up front, there are stretched-back headlamps that carry projector setups, a bold bumper, and a chrome-plated grille. In side profile, the car looks more or less the same but offers a sportier set of alloy wheels. At the rear, there is a very Volvo-like pair of L-shaped tail lamps. 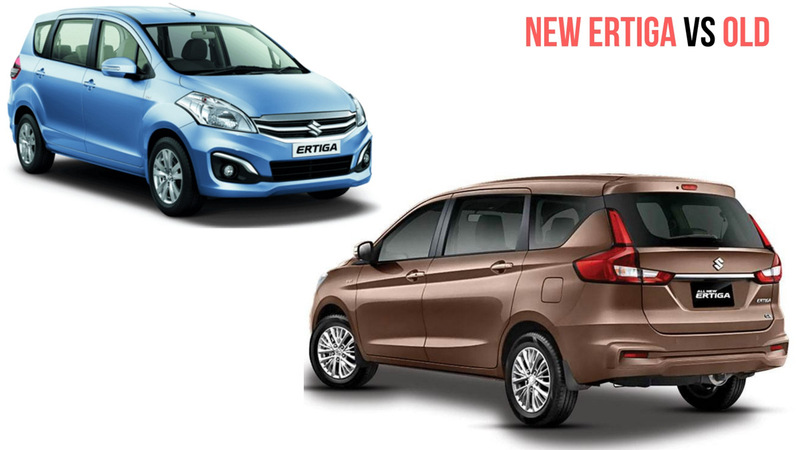 In comparison, the stop lights on the current Ertiga are much smaller and look boring. One thing that is very clear is that the new version of the popular MPV looks far more appealing than the outgoing model. The Volvo-like design touches should help it score many brownie points. 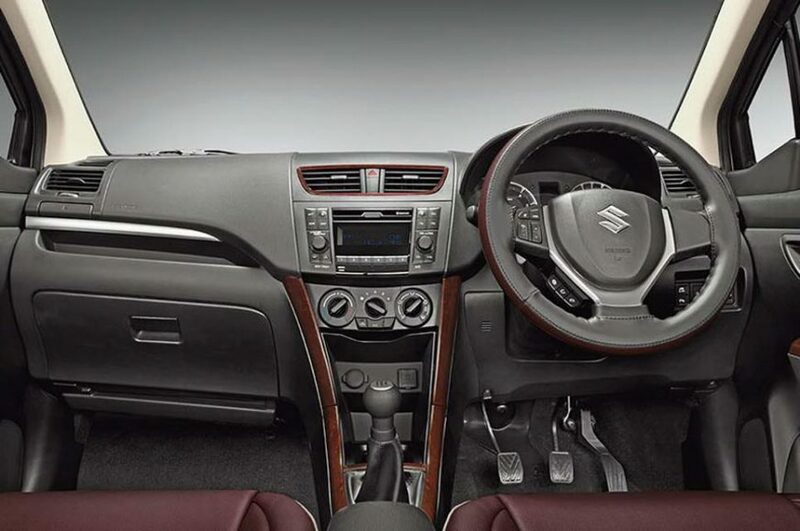 Like the exterior, the interior of the new Ertiga is a step up from the earlier version. Unlike the interior of the outgoing model, which looks a lot like that of the Swift, the new version’s cabin doesn’t have much in common with any other model from Maruti Suzuki. 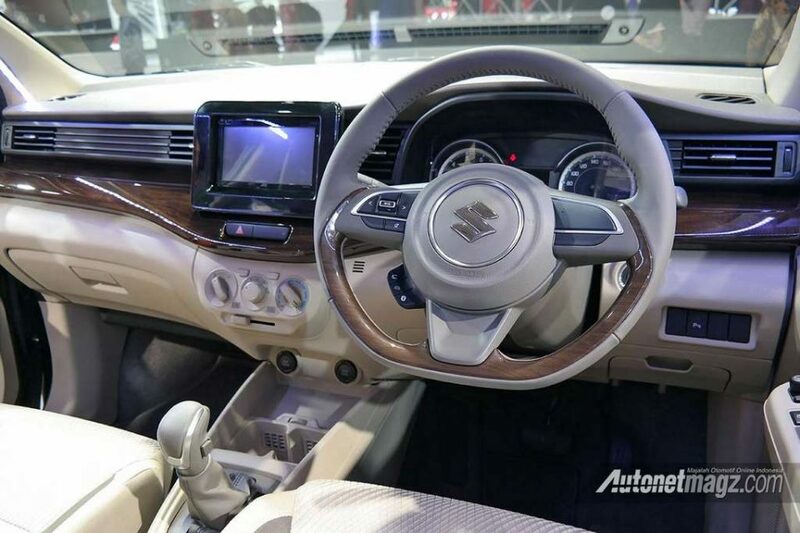 Its dashboard has a much higher appeal, which is further enhanced by liberal usage of high-quality faux wood and an Audi Q7-like treatment for the dashboard design. Unlike the older model, which had an all-black colour scheme, the new version features a beige interior that looks much more upmarket. Another highlight of the new model’s cabin is the more space on offer. While the wheelbase of the new model, at 2,750 mm, remains the same, it is as much as 99 mm longer, 40 mm wider, and 5 mm taller than the outgoing version. This has led to more legroom for passengers in all three rows. From this review, it is clear to see that the new iteration of the MPV is a step up from its outgoing version. 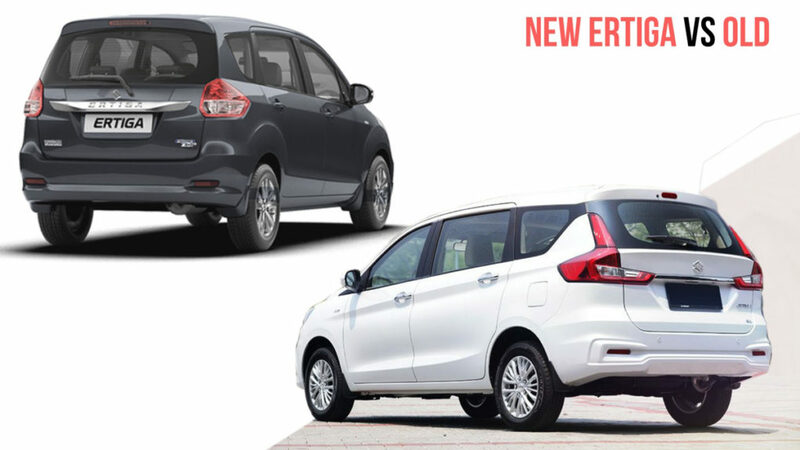 Hence, it becomes the winner of our new 2018 Maruti Ertiga vs Old Model comparison.